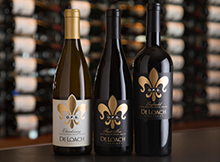 DeLoach Vineyards, the pioneering Russian River Valley producer of award-winning Pinot Noir, Chardonnay, and Zinfandel, released its Estate Chardonnay and Pinot Noir with the 2010 vintage. Our Estate Vineyard is certified Biodynamic® and organic and represents the culmination of a long and dedicated effort to become a more self-sustaining and environmentally friendly producer of fine wine. 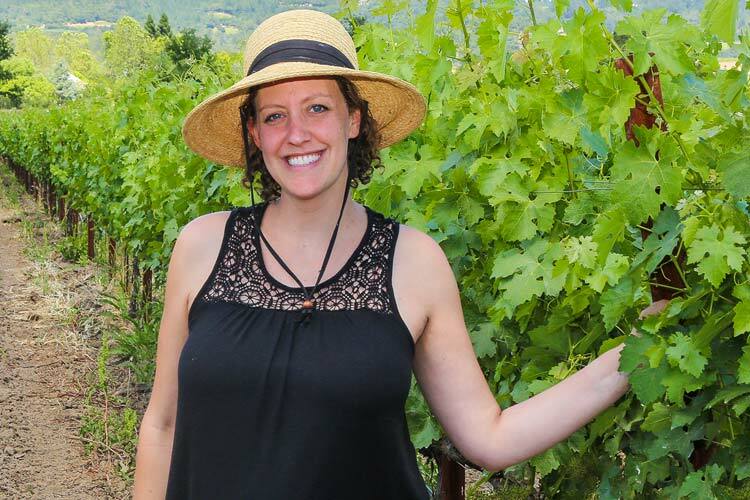 When the Boisset family purchased DeLoach Vineyards in 2003, one of their first decisions was to convert the 17-acre estate vineyard surrounding the winery to organic and Biodynamic® farming. Decades of conventional chemical farming had left the soil tired and drained. The vineyard, with its prime location on an eastern bench of the Russian River, is one of the primary assets of the winery and one of the first things that visitors see upon arrival. Restoring the vineyard was a chance for the new owners, under the leadership of Jean-Charles Boisset, to demonstrate their commitment to changing the wine industry from within. These changes included Earth-friendly innovations in how wine is packaged and delivered to consumers, but they began with the Earth itself. The DeLoach Estate Vineyard would not just be replanted, but reborn in order to exemplify how great wine comes from great sites that are allowed to express themselves naturally. 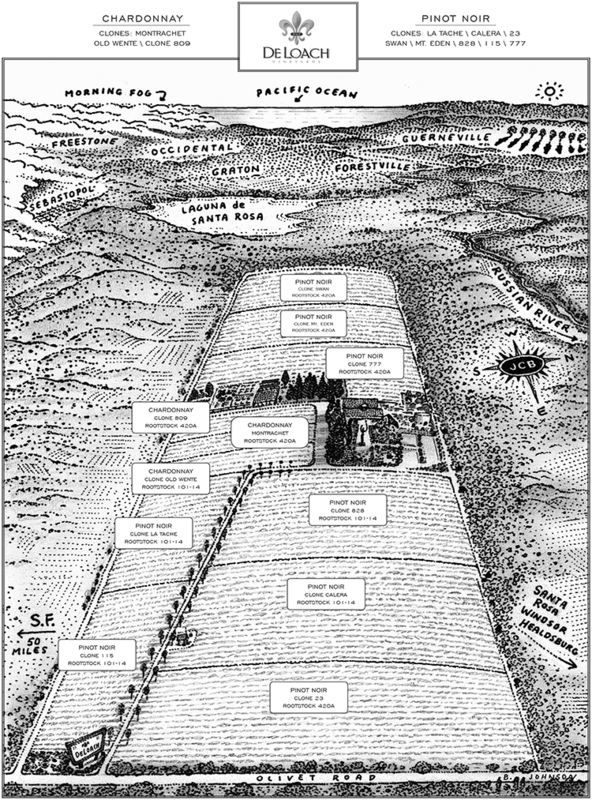 The process of restoring the DeLoach Estate Vineyard was conducted from the perspective of nature. A conventional farmer might have simply pulled out the old vines and put in new ones. The DeLoach team, however, began by restoring the health of the land. The vineyard was allowed to recharge itself by growing cover crops that return essential nutrients to the soil. Farmers call this letting the land go “fallow”; simply put, do nothing but let the land grow something different for a change. Biodynamic agriculture takes the restoration process even further. The first cover crop planted was safflower, whose deep roots drew moisture up and out of the sticky clay soil of the Russian River floodplain. Once the soil dried out to a more balanced level of moisture, it was turned over at a depth of several feet. This introduced more space for oxygen and water, which make up nearly half the composition of good winegrowing soil. The soil was then amended with a combination of rock phosphate (a natural slow-release form of phosphorus), lime (to raise the soil pH and adjust the calcium/magnesium ratio), and a Biodynamic compost preparation. Production of the compost had begun the winter before and was a mixture of organic barley straw and clean cow manure containing no hormones or other chemicals. DeLoach acquired manure from local dairies, thus recycling the natural nutrients from the manure back into the local ecosystem. A hundred tons of manure and straw were formed into a large windrow, covered with straw to hold in moisture and heat and thereby encourage metabolic activity. At certain points in the compost’s development, the winery added Biodynamic preparations, teas made from beneficial plants. The preparations further stimulated and focused the compost’s metabolic growth. During the first cover crop season, DeLoach applied horn manure to the soil to introduce more beneficial microorganisms. Horn manure is made by filling a cow horn with dried cow manure, burying it in the vineyard, and letting it remain there all winter. The horn shape is one of nature’s inventions, and Biodynamic adherents see it as focusing the decomposition process while the horn is buried underground. When fully broken down, the finished compost is essentially “bugs in a jug,” or soil inoculum, because it contains microorganisms that have naturally adapted to the farm’s soil conditions. In the second year of vineyard restoration, the vineyard soil was again inoculated with horn manure and its host of beneficial microorganisms. These minute living creatures carry nutrients into the soil and distribute them evenly to encourage the formation of good soil structure. Then DeLoach planted a winter cover crop of barley, vetch (which fixes nitrogen in the soil), and indicator plants, which are known to either thrive or wither under specific soil conditions. Like a canary in a coal mine, the indicator plants helped DeLoach’s vineyard experts understand what was going on in the underlying soil. After the second cover crop had successfully run its course, the vineyard was ready to plant to Pinot Noir and Chardonnay. Planting took place according to the Biodynamic calendar, which takes account of celestial and terrestrial movements such as the moon and tides. According to astronomers and geologists, our Earth and moon are part of a single gravitational system because of their close proximity. This explains why the moon can create the powerful tidal forces that are easily observable at the seashore or in the mouths of rivers as they reach the sea. In fact, the moon creates tidal effects in many other places as well, including lakes, streams, underground reservoirs, and river floodplains like the one surrounding DeLoach Vineyards. Even after planting the new grapevines, the vineyard’s rebirth was not complete. From a Biodynamic point of view, everything moves in cycles: instead of endings, nature continually finds new beginnings. DeLoach therefore continues to plant a variety of cover crops alongside the vines to encourage beneficial insects and microbial diversity, and enhance soil fertility and structure. The estate vineyard is now a rich ecosystem in which grapevines are able to express the unique combination of soil, climate, air, water, nutrients and human attention that turn the concept of terroir into a tangible reality. 2010 marks the first vintage of wines from the estate vineyards at DeLoach Vineyards since their conversion to Biodynamic farming.